Apple is allegedly pointing to Apple Music as an example of how it can build a successful subscription business, but is encountering resistance for several reasons, among them the view that newspapers and magazines are inherently different from music -- a person who reads Scientific American may be unlikely to care about an all-you-can-eat subscription that includes People and vice versa. Publishers have mused however that they might benefit if Apple News is rolled into a broader Amazon Prime-style bundle, and that some publications, like the Wall Street Journal, may have nothing to lose -- Apple News users are purportedly seen as "older, Middle America women" for the most part. Apple is allegedly pointing to Apple Music as an example of how it can build a successful subscription business, but encountering resistance for several reasons, among them the view that newspapers and magazines are inheretly different from music -- a person who reads Scientific American may be unlikely to care about an all-you-can-eat subscription that includes People, and vice versa. Couldn’t the same be said about Apple Music? My MIL, for instance, loves country music and pop but “may be unlikely” to listen rap or R&B. Also, we have a subsription to WSJ and don’t pay nearly $39/month for it. Typically we get 6 months for $99 and that’s delivered to our house 6 days a week, plus online and in Apple News. Would these people rather have half of something or one-hundred percent of nothing? $10/mo for Apple Music, $10/mo for Apple News, $10/mo Apple Streaming, $10/mo for Netflix, $10/mo for Hulu, $10/mo for CBS All Access, $10/mo for Curiosity Stream, and on it goes. How’s that cord cutting looking these days. Could we not see this coming? All that a la carte stuff adds up real quick doesn’t it. Then add $45/mo for Sling and its competitors. Suddenly that $120/mo I pay Spectrum doesn’t look so bad anymore. Oh, and of course, the cost of your Internet connection. 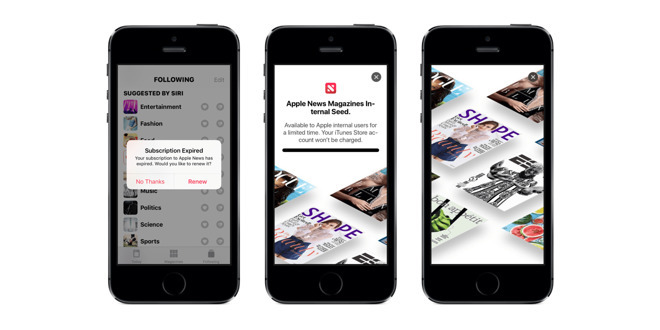 Looks like only Apple would benefit from Apple News, who could have guessed that? Apple may pretend it is news publishers' savior instead it will be cheapening their services and diluting their brands. Apple may decide to edit as in censor news and editorials to protect Apple from being sued for something a magazine or news paper published with them. Don't take the bait publishing world! I'm starting to view this big day more w dread than excitement. Hope Apple can purge this aura of clumsiness-- if these reports have truth-- and show its ready for prime time in these new spaces. I think there will be some roughness to the service on rollout, but the rough edges will disappear over time. This whole print/news thing is going to be a tough nut to crack. People simply don’t value news anymore because they can get it for free. If I can’t get the information I need from source a because it needs a subscription, then I will just go to source b. If the news wasn’t there *at all* anymore, I think the story might be a little different, however today it’s all out there if you look for it. Apple have been having a go at this for a while now, at least since iOS 6 (or thereabouts). Each model has failed with the publisher or the consumer not getting on board in any meaningful way. An a la carte approach (that was autocorrected to cartel ) doesn’t make sense to me. If I were a reader of “The Australian” it’s highly unlikely I’d be a reader of “The Sydney Morning Herald” or “the Guardian”. I know country and pop live together on Apple Music but print goes deeper than appreciating music. That not to say music appreciation is a superficial endeavour, but Print and news goes to how we perceive the world around us and many of us have developed set views about a lot of things. It’s different. The half of something vs all of nothing argument is just saying hey let’s spiral out the back door a little more slowly. And give apple some cash on the way out. I’ve always tried to take the approach of not complaining about something without having a solution. For print, I don’t see a solution. I certainly don’t think this is it. I happen to like apple news and I do use it on and off, but if the article needs a sub, there’s another right next to it in the feed that doesn’t. Apple wanting 50% is pure greed. I would refuse to sign up with Apple also. Companies are having issue with Apple getting 30% and even 15%, BUT 50%? If Apple thinks in going to sign up to all their different $10 a month packages, good lick with that. $10 for this, $10 for video streamingvservive. My guess! Plus another $10 for Apple Music. If Apple thinks they're getting $30 a month from me, ... Lol. Or....we could just wait and see what the presentation is all about and get all pissy afterwards instead. The Apple News app should (as an option) read news stories aloud to the subscriber. I know the reader can be invoked through Accessibility services, but it should be integrated into the News app itself, with easier-to-manage controls. I would use the News reader + screen mirroring + AppleTV + TV set in order to passively listen to the news, with big-format text and photos available on the TV set when desired. I would prefer that alternative to most TV news broadcasts, since I would have more control over the sources of my news. The Apple News reader (with or without screen mirroring) would provide a more effortless way of consuming the news than conventional reading. When a person is tired from a long day of work or must look away frequently, the reader could make the difference between consuming the news or not. Every time someone puts for this silly argument I say the same — no one expects you or anyone to get all the services. I get one year round (Netflix) and one seasonally (HBO for GoT). I am without a doubt spending less than a cable TV subscription. And haven’t had one for 15 years...the savings is real. What. On earth...? Yeah no. That’s tinfoil hat talk. No! We must present our moral outrage and clutch our mother’s pearls now! What a mixed message. Apple "Everyone should learn how to code, after you listen to Drake and Cardi B, after you read Glamour magazine and the daily Apple News" Apple has strayed a bit from the success that the founders created by intersecting the arts with computer science. Take a step back ...stop trying to push so many boxes and services and decide where you want to be. The messages coming from Apple's actions are as confusing as ever. Do you want to build cars or get kids involved in STEM or have us all consuming vapid media content? All the Above. Got it. I'm surprised someone hasn't already blamed Eddy Cue for this and asked for his head. I am looking forward to this and hope it is highly successful. Ever since the 2008 collapse, I have paid close attention to the news because things have been both tenuous and crazy -- because financial conditions are riding on artificial turf rather than a solid, fundamental base. But, there are many things that can impact that and no one media service provides the news and insight I need to manage my life and my finances. But yet, I have no desire to pay out a bunch of yearly subscriptions to every news source I access. I look forward to Apple collecting those news sources into a single, manageable, affordable stack for me. In Apple Music, Apple doesn’t take 50% of all revenue and then split the remaining 50% between each artist. They pay per stream (I believe). This is a very different model to AM. Check out the app Voice Dream. I set up all the articles I want to read and play them in the car. Bloody brilliant app.